With a strong engineering team committed to innovate and validate processes for industrial gases GASLAB remains one of the few innovators in this industry. Finally, our experience of over a hundred CO2 systems in over twenty different countries of the world imparts a uncompromising practicalitysense of practicality to our approach which reflects in each product and service in our offering. We subject ourselves to some of the toughest standards of quality in the World. Each manufactured equipment is designed as per American standard i.e. 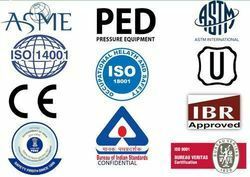 ASME Boiler & Pressure Vessel Code (BPVC )guidelines and approved by international third party inspection agencies like TÜV, BVIS and DNV. Our Quality Assurance System (QAS) is appreciated by all quality agencies and various industry leading companies in the form of our customers. Our bought out equipment are sourced from theinternationally reputed equipment manufacturers. Apart from this we also hold them to our own standards for quality, delivering to you only the most reliable bought outs. We are an accredited manufacturer and exporter of several gas plants in India & associates in America, Germany and other places. The plants made in India make use of world standard raw materials and components. Our quality products are exported all over the world including East Europe, East Asia, North Europe, Middle East, South America, South/WestEurope, `South East Asia, East/Middle Africa, South/West Africa, North Africa & Europe.